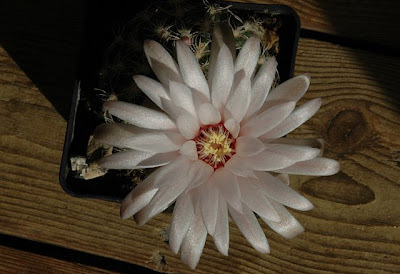 I have only one Gymnocalycium calochlorum (Mina Clavero, Córdoba, Argentina) plant in my collection and it flowers freely every summer (I’m not sure if this should be put in the past tense as I’m uncertain if the plant survives this winter’s hard frost; the photos in this post are all from the summer of ‘09). The last time the G. calochlorum plant flowered I self-pollinated it and as the pictures show my efforts (as well as the plant ;-) bore fruit. 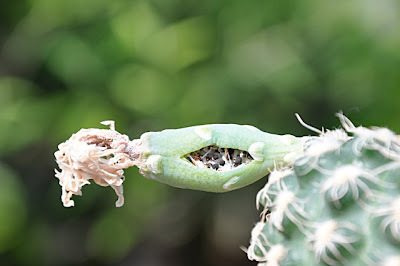 My experience with Gymnocalycium is very limited and I don’t know if these plants in general are self-fertile – anyway, this one bore fruit and the coming spring will show if the seeds are actually any good. 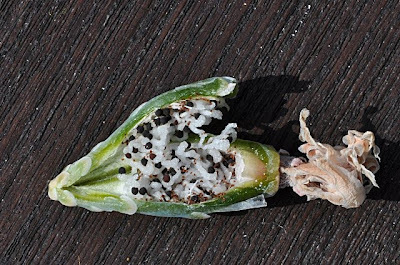 I’m pretty certain that the seeds are the result of selfing – of course I can’t say for absolutely sure but I hand pollinated the flowers and none of the (very few) other gymnos in my collection were flowering at the time. 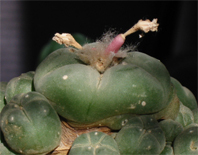 Theoretically the seeds could be the result of some freak hybridization but that doesn’t seem very plausible, as most of the other cacti in my collection are of North American origin and not closely related to Gymnocalycium at all. I pollinated two flowers that both set fruit. The last fruit is still growing on the plant. 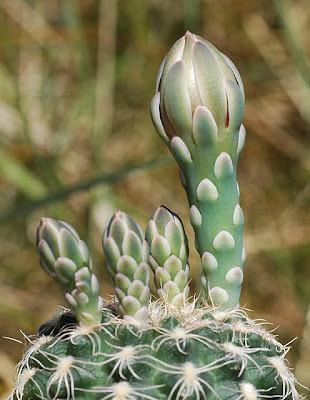 One more flowering cactus of the summer past. 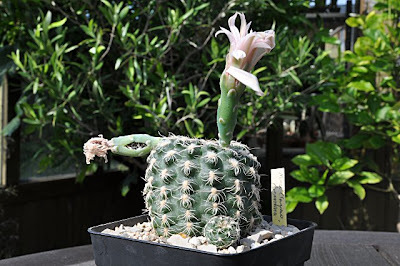 I don't have many Gymnocalycium plants in my collection but find the ones I have quite interesting – especially the large flowers and the naked calyx are fascinating (the genus name Gymnocalycium comes from the Greek for "naked calyx"). 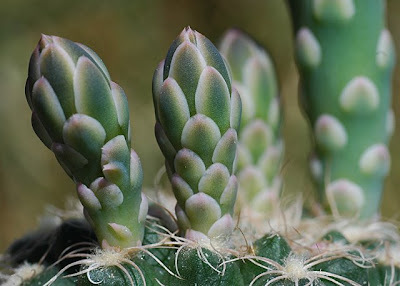 I bought this Gymnocalycium calochlorum (Mina Clavero, Córdoba, Argentina) a couple of years ago and it has been growing in my coldhouse since. It is coping well in this environment and is showing off a wealth of flowers each summer. The pale pink flowers with the burgundy throat are quite beautiful and almost hide the plant.